A long time ago, when I was 31 years old, I came to what in retrospect was the most significant turning point in my life. I had spent two years in a YWCA support group for battered women. I really wasn’t sure how to go about doing that – truly no idea – but I set my intention then and there to be happy and to go about the process of figuring out how. Today, I count myself lucky to be one of the happiest people I know – not that I don’t go through my share of setbacks, repositionings, major life mistakes and constant reevaluations – because I do. But I truly keep constant awareness of this subtle golden thread of happiness – kind of like an internal thermostat – not too hot, not too cold, constantly readjusting to maintain my inner sense of deep contentment, joy and even ecstasy. This blog is my little attempt to share what wisdom I may have gained up to this point. On Monday, I got to spend time writing, some time walking outside in nature taking photographs of flowers and several hours out in the sunshine with my dog Belle in my garden spreading pine bark mulch, weeding and tending. It was one of the happiest days I can remember! The day before, I had consulted with a new client who came in for a medical intuitive reading to understand why she has been suffering constant pain in her right lower back – despite regular chiropractic, cranio sacral therapy, massage, yoga and good nutrition. It turned out that one aspect of her low back pain was a syndrome that we in kinesiology refer to as cardiac low back. In sum, your low back gives out due to severe exhaustion. Part of this exhaustion may be physical but part may also be spiritual. We all need to learn how to feed our soul. You can be doing everything apparently right on the physical level but if you don’t look closely for the golden thread of happiness in your own life you can continue to suffer mightily. Over the years, as I paid attention to myself, I began to notice that on the days when I moved my body regularly I felt happier. This awareness led me to make a career as an aerobics teacher, then a step aerobics teacher, then a water aerobics teacher, then a physical fitness trainer for 23 years, a yoga teacher for 20 and qi gong teacher for God knows how long. I have studied virtually every aspect of movement therapy as I find the intimate connection between our mind and bodies so fascinating. While I have cultivated a very healthy body and mind, in recent years, I have rediscovered the value of writing down my soul. Tom’s contention is that we writers have this soul voice that is pushing to come through. An unexpressed writer is basically a person not quite comfortable with herself. The books that are rumbling around in our soul make us a bit edgy until we sit down and write them. Tom Bird feels that books are actually written on the other side. We, as authors, have a soul contract to deliver these books through us to everybody else – if that makes sense, kind of like a spiritual literary midwife. Whether you are a writer or not, if you don’t listen to your soul, you will feel ill at ease – even if you can’t put your finger on exactly why. I have often found working with other creative people that practicing their art is their most ideal form of therapy. About a year ago, I was working with a painter who came to me suffering from depression. After listening to her at the soul level, I heard quite clearly that if she did not paint for a minimum of an hour and a half at least every other day that she would continue to feel depressed. My soul may need to write and someone else’s soul may need to paint, but the real question is what feeds YOUR soul? What is your soul longing to express, to experience, to taste, to enjoy? 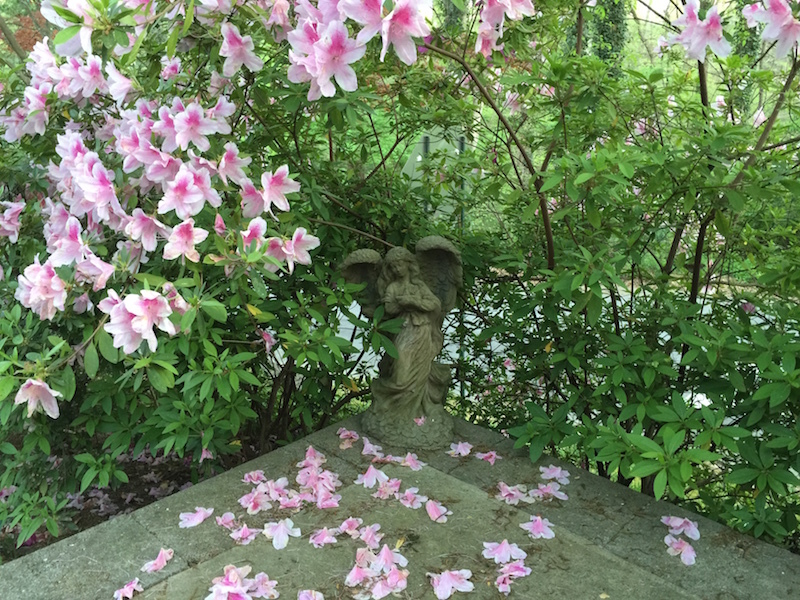 Walking in nature, teaching yoga and qi gong, taking photographs, raising my orchids, playing with my dog Belle, writing books, gardening – these are all practices that feed my soul at a very deep level. My ideal day used to be to exercise for one hour – didn’t matter what kind of movement. Then I realized I needed to write also – didn’t matter how long. And then maybe throw in a sprinkle of orchids, of glorious garden energy, a wagging tail 13-year-old rescue puppy and life feels as good as it ever gets. Healing happens when you take the time to feed your soul. Thank you for this. I really love it! And thank you so much for all your writings!